After first spy photos of the 2014 BMW i8, here comes the first footage of the same car spotted during winter testing in Sweden. Judging by the sound engine, the BMW i8 prototype seem to continue testing the three-cylinder diesel engine that was initially revealed with. Recent reports indicate that due to low popularity of diesel outside of Europe, the powerplant will be replaced by a gasoline engine. The concept study BMW Vision EfficientDynamics was revealed in 2009 at the Frankfurt Motor Show and represents the future of driving pleasure, as BMW described it. Just 1.24 meters high, the 2+2-seater takes up the characteristic BMW shaping style, geared consistently towards aesthetic appeal and dynamic performance. Wing doors facilitate entry to both rows of seats, while extensive aerodynamic measures reduce the drag coefficient to 0.22. The gasoline or diesel engine will be paired with a hybrid synchronous motor at the front axle and a full-hybrid engine at the rear axle enables an overall system output of 241 kW/328 bhp. The final performance numbers are far from being finalized, but BMW anticipates the i8 to run to 100 km/h in just 4.8 seconds – with an average fuel consumption in the EU test cycle (KV01) of 3.76 litters/100 kilometers, equal to 75.1 mpg imp, and a CO2 emission rating of 99 grams per kilometer. The BMW i8 will be built at the Leipzig plant and according to BMW, the total volume we should expect varies between 5,000 and 10,000 units. 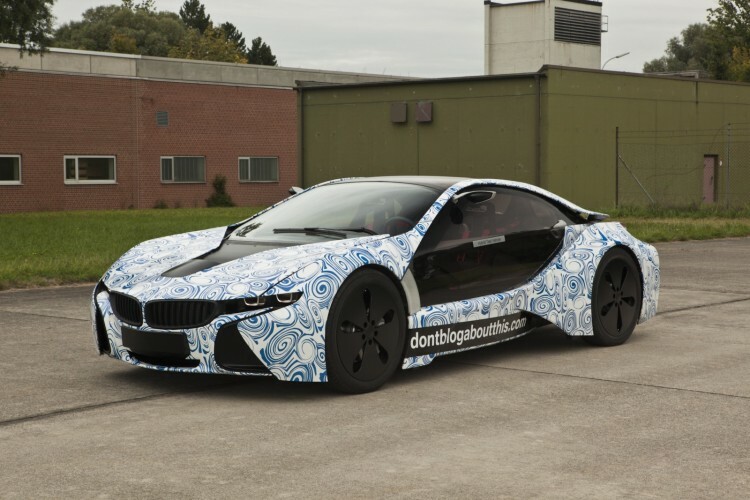 Last year, BMWBLOG was one of the five automotive publications invited to enjoy ride in an i8 prototype and at the time, we shared our first impressions.